I was reading a piece earlier in the week that was questioning the point of Rosé wine. The view put across was that Rosé wines lack the freshness of a white wine, and lack the depth and body of a red wine. Consequently, they end up somewhere in-between. I’m not much of a Rosé drinker, but when the weather turns to early sunshine as it has done this week, I’m looking for my shorts, dusting off the BBQ, and well up for a glass of Rosé to top it off. 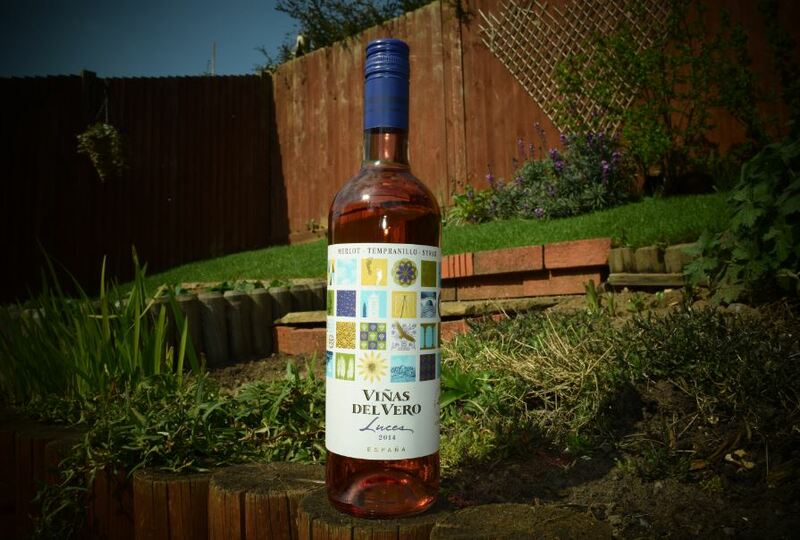 By lucky happenstance, thanks to the lovely people at Tesco, this week I’m reviewing for them a Rosado from Spanish Producer Vinas Del Vero (named after the River Vero which runs through their vineyards). The wine comes from a Northeastern Spanish region called Somontano, which is tucked in to the foothills of the Pyrennees (Somontano literally means ‘at the foot of the mountain’). It’s a well-known wine region, but I’d argue that it wouldn’t be the first one that comes to peoples mind when thinking of Northern Spain – that honour would probably go to places like Rioja, Priorat, Rueda, or maybe even to Penedés if they love their Cava. The DO (Denominación de Origen) of Somontano is fairly youthful, having been created in 1984, and the Vinas del Vero were established only a short time later in 1986. They are owned by famed Sherry producer Gonzalez Byass. The new range of wines is named ‘Luces’ (Spanish for Lights), and is marketed as a contemporary blend of internationally recognised grape varieties, with labels that draw from local culture, nature, architecture and tradition. They’ve certainly come up with a striking design for the Rosado, even down to the blue screw top setting off the dark colour of the wine. The 2014 vintage Rosado is comprised of 3 red grape varieties – The famed French grapes of Merlot and Syrah alongside the Spanish stalwart Tempranillo. All were planted between 1988 and 2000 in the sandy/stony vineyards that lie between 350-450 metres above sea level. Nipping back for a second to the article I mentioned at the start of this review, part of it was given over to the best way to appreciate Rosé wine, and the recommendations were not to over-chill the wine, and to serve it in a red wine glass, treating it almost like a light red wine. So for this Rosado tasting that’s what I did, and for the sake of experimentation, I then chilled another standard glass down to white wine temperatures (i.e. straight from the fridge). As mentioned earlier, the colour is towards the darker side for Rosado, something I would describe as wild salmon (as opposed to farmed). It probably picks up a lot of its colour from the combined use of three quite dark grapes. The nose is at odds with this darkness and is instantly light, clean and full of fresh ripe red fruits. For the taste test I tried my over-chilled version first, and it wasn’t pleasing. The nose took a while to stand out, and the palate was almost exclusively water-like (from the high acidity), with just hints of red fruits on the centre of my tongue. Trying the less chilled version was a completely different story. The palate is at once refreshing from the instant tingling acidity, but you are then hit with a wave of red fruits led by cherry, on to hints of raspberry and strawberry, and then backed up with cranberry on the finish. What also appears is a decent weight to the wine which, when matched with the darker colour, creates a fuller overall experience. The finish is an interesting thing – there was something there that I couldn’t put my finger on. It would have been easy to note it as ‘complexity’, but I don’t think we’re in that arena really, and this is still an everyday sunny day drinking wine. It can be drunk on its own quite easily, or with food – The back label suggests a food pairing with fish and so, as I loved the colour of the wine, paired mine with Salmon (farmed) and it went fabulously. In the end I settled for the palate-closer being sweetness driven by the alcohol which clocks in at 13%. In the glass that I chilled right down, the finish was short and fresh, and I couldn’t really taste any sense of the slightly above average alcohol level. On the less chilled version, the fruits really round out at the end, you get a pleasing fuller finish, and more importantly, you get a much longer finish. Don’t worry though if you do over-chill yours by accident and get the shorter finish. It’s such a pleasing moreish Rosado that it won’t be long before you’re reaching for your next glass. With thanks to Tesco and Vinas Del Vero for providing the bottle used in this tasting. I’ve recently become aware of the Tesco Wine Community – a group of like-minded individuals musing, comparing wines tasted and talking about new wine experiences. Loving a good chat about wine I immediately signed up. Forums on wine are nothing new, but this is one with a difference, and that comes directly from the ‘Wine Enthusiasts’ within Tesco. Every week they run a tasting panel – they choose a particular wine, open a new topic thread, and anyone interested in trying that particular wine can register to get a bottle – Free wine! Well, not quite – In exchange you agree to write up a tasting note on the wine and paste on to the forum and the Tesco website. Seeing the passion that other members have displayed when reviewing previous bottles makes you up your game, and many clearly spend a good deal of time and effort. It still sounds like a good deal… and it is. The more lively a member you become, you move up ranking levels (Bronze, Silver and Gold). The higher the bracket you are, you may even be lucky enough to be chosen as forum ‘Member of the Month’, and you get a whole case of wine to taste and review! 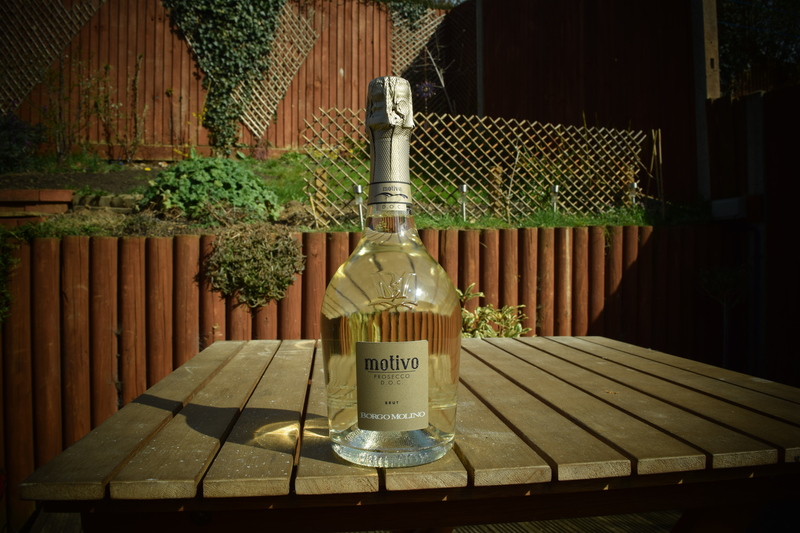 I haven’t quite earned that privilege yet, but I did manage to get on a tasting panel for Motivo Prosecco D.O.C Brut from Italian producer Borgo Molino. From my regular blogging you will see that I have a love of all things sparkling, be that the classic Champagne, through to my recently tasted Slovenian sparklers, so this tasting seemed like a bottle right up my street. The good news is that there is absolute freedom as to how you conduct your tasting, with no set formats (I personally conducted mine in both ISO approved tasting glasses and standard flute). All levels are welcome on the forum so you don’t need any tutored expertise in tasting, just enthusiasm. From a background perspective, Prosecco is a sparkling wine from northern Italy, and I would suggest, along with Spanish Cava (and maybe English Sparklers) the major competition to Champagne. There are probably three majors factors that will drive a purchase of Prosecco over Champagne (aside of patriotic duty), and these are quality, price and sweetness. Production of sparkling wines the world over run the gamut from wine spending years in bottle undergoing second fermentation and lees ageing, through to wines that undergo carbonation (think fizzy drinks). Thankfully we’re in the former territory here. The bottle in question is worthy of note and care has obviously gone in to the design and production. It’s fairly reminiscent to me of Ruinart Champagne, with its squat bottle, gold foil and beige logo, and the embossing on the front of the glass is a nice extra touch. When comparing this bottle of Prosecco to others in my local Tesco, it was a stand-out. Some still have a light blue foil on the bottle – this to me says sweet wine (think Babycham), and it’s good that this one has erred to more ‘earthy’ colours, which make me think terroir, ergo rustic and well crafted. Of course, these extra touches all count towards the total cost of the bottle. 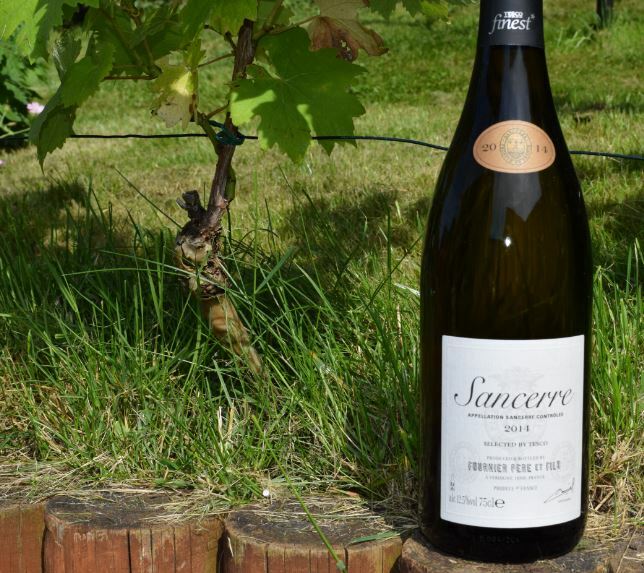 The next thing to notice is the extremely pale straw yellow of the wine, suggesting subtlety – again very similar to that of a Blanc de Blancs. The wine clocks in at 11% abv as you would expect from a Prosecco, and there’s no visible tears on the glass. A good barometer of the quality within the production methods of sparkling are the size of the bubbles – false carbonation gives a larger bubble. Thankfully, here we have a tiny bubble which in turn gives a subtle spritz of flavour rather than a gaseous overture. On the nose I get a fresh and zesty lemon citric note, alongside pipped fruit – yellow melon, and green notes – at first this was pear, but it moved along to fleshy green apple. The initial palate is an explosion of froth – light and refreshing – and virtually evaporating in the mouth. Once this dissipates, the first hit is of clean youthful lemon and green fruit. This quickly gives way to a secondary note of something bordering on creamy tropical, stopping short of pineapple, more akin to passion fruit. The vibrant acidity continues the refreshing notes of fleshy green apple. For such a light bodied wine, it is a compliment that it has such length of palate. Once the initial fruit gives way, I get hints of smoke and a calculated bitterness – something to give some sort of depth to the linear cleanse, and further indicating care in the winery. With the alcohol at a light 11% there are some noticeable touches of sweetness on the palate, but nothing cloying, and I could happily drink this as a refreshing aperitif. I tasted the wine on its own, but paired with food this would be an easy match with starters or hors d’oeuvre. I really hope that Tesco continue this initiative in showing their commitment to their range, listening to their customers, and fostering a vibrant community. What with their recent well publicised financial troubles, this could be something that easily falls by the way-side as an unnecessary expense, but I really hope it doesn’t. With thanks to Tesco and Borgo Molino for the bottle used in this tasting.